New Zealand’s influential Todd family may have found a mouse that roared in its move to delist Australian iron ore explorer Flinders Mines Ltd (ASX: FMS). Chief resource writer for the Perth newspaper The West Australian, Stuart McKinnon, said minority retail shareholders of Flinders Mines have vowed to continue a fight to stop the company from being delisted from the ASX regardless of whether the Australia’s Takeovers Panel rules in favour. The declaration came as a second aggrieved shareholder yesterday lodged an application with the Panel opposing the planned delisting. Writing in the Weekend West, McKinnon said “mysterious institutional investor” OCJ Investment, which holds nearly 22% of Flinders on Friday joined shareholder Brendon Dunstan in seeking orders prohibiting the company from proceeding with delisting. McKinnon said OCJ is the biggest single shareholder behind New Zealand’s Todd Corporation, which holds a majority stake in Flinders and backs the proposed delisting. This news prompted a 50% slump in Flinders’ share price and raised the ire of minority shareholders who view the proposal as a ploy by Todd to tighten its grip on the company by squeezing them out without having to pay what they see as the type of premium typically associated with a takeover. The West said Todd holds about 55% of the company after two failed takeover attempts in 2015 and 2016. Its majority holding in Flinders means it can secure the delisting via an ordinary resolution at a proposed meeting of shareholders on January 22. Minority shareholders have called for regulators to intervene by either rejecting the proposal, forcing Flinders to pass the vote via a special resolution which would require a 75% majority or preventing Todd from voting altogether. A small group of aggrieved shareholders turned out at Flinders’ West Perth office on Friday to voice their disapproval of the delisting. Shareholder Margo Gould told McKinnon she was delighted the Panel was considering the group’s concerns after the ASX and ASIC had shown no regard. She claimed minority shareholders would explore every avenue to prevent the delisting, including a possible 249D notice aimed at removing the company’s board. Flinders has struggled for years to develop its stranded 1.4 billion-tonne Pilbara iron ore project (PIOP). Todd Corporation is also the majority shareholder in BBI Group, which has proposed a $6 billion port and rail project in the Pilbara, potentially providing a transport solution for Flinders’ project. Progress on that has been slow, not helped by the daunting cost of developing new iron ore mines in the Pilbara. The control block for Flinders Mines was gained after a bitter takeover battle, at a time when the company’s office was in Adelaide and the company had slipped to be a penny stock. In the past year Flinders’ West Perth-based administration pointed out that a considerable amount of work was required to achieve a substantial and possibly higher grade resource on PIOP for development. The company has another large resource project in Western Australia where several base metal targets were seen, but results in recent times have been generally disappointing. 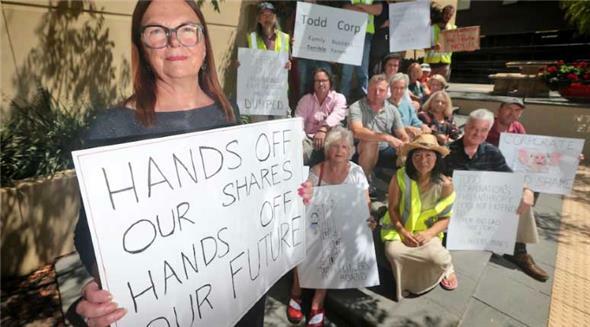 Margo Gould, spokeswoman for Flinders Mines’ minority shareholders, with other minority shareholders outside the company’s West Perth office Photo: Danella Bevis, the West Australian.